The Mission District usually gets the credit for having been home to Carlos Santana, but the truth of the matter is that Santana commuted to the Mission from Bernal Heights. The house is on the north side of Mullen just east of the Franconia steps. There is a Franconia cul de sac that runs south from Mullen just east of the bend as you drive up (east) Mullen from Franconia. The first house to the east of the steps is an old storefront. The second house is a shingled cottage. Maybe not shingled. That’s the one. 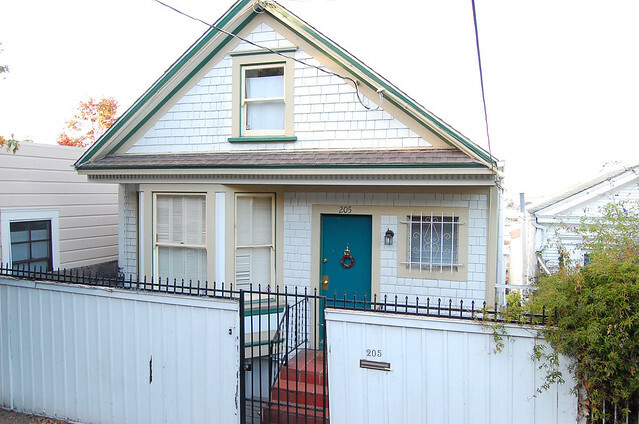 It is flanked to the east by a cottage that is set back from the street. 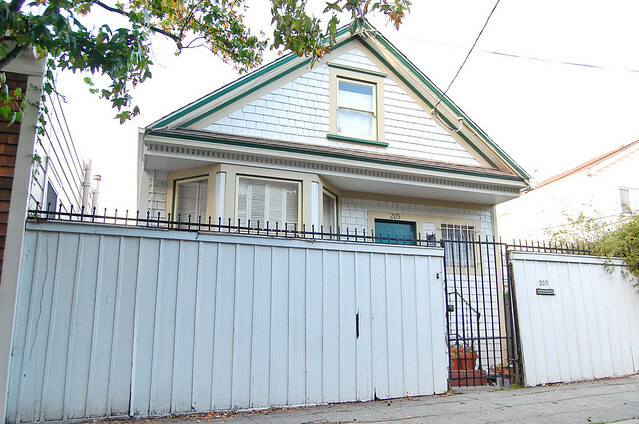 Neighbor Peter confirmed to Bernalwood that the home shown here was indeed the Santana House. Carlos, if you’re out there… care to chime in??? Haha! I’ve lived on Precita for 20 years and you can’t believe the rumors that have circulated about which is the Carlos Santana house. We always thought it was around Precita and Bryant. Thanks for clarifying! Whoever lives there, they definitely get the ugliest fence award! Dear friends of mine live here, and yep, that’s the Santana house. It’s true, this is the Santana house. 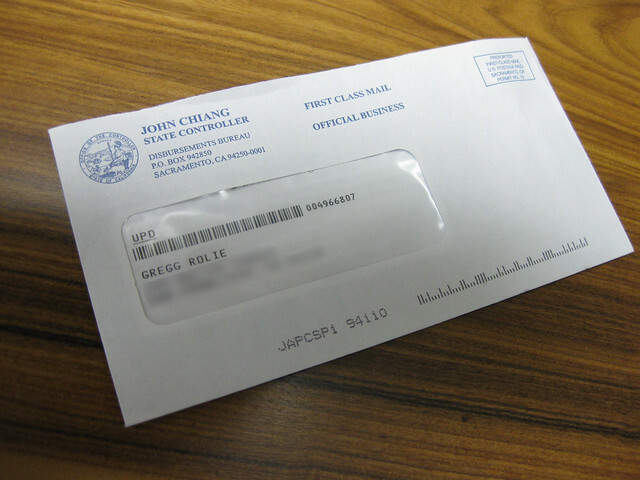 Soon after we moved in we received a royalty check addressed to Greg Rolie of Journey. We got the letter to him and he was kind enough to confirm that the Journey guys had lived in the downstairs, and Carlos and his girlfriend had lived in the upstairs, circa 1968/69. Bernalwood has taste and cool residents! Maybe we can do a variation on the Tom Sawyer fence painting and have a remove and redo a more beautiful fence contest. I’m sure Rob and Susi would appreciate it. Good idea! I just replaced a horrible fence at my place, otherwise I would have claimed the fugly crown myself. Lol, sorry Rob! You do have a very cute house…. behind that fence! Hey no problem, it’s a truly ugly fence and needs replacement. Just haven’t figured out yet what would look good. Suggestions welcome. So Bernal residents are claiming Santana as their own! Mission resident feels compelled to chime in here…. Maybe he lived there for awhile but he created his music in the Mission. I live on Ramona in the Mission, and one of our long-time residents remembers hearing his band rehearse in a Ramona garage right near the corner of 14th Street. Yes, that may well be true. As we noted… he commuted to the Mission from Bernal. I lived across the street from this house from 1968 to 1982. I remember all of us (kids) trying to get this guy’s autograph. Turned out to be Carlos Santana. He was gone alot but girl friend and her 2 kids (names withheld) were there all the time. We played together all the time. They moved to Mt. Tamalpais (I forget when) and I visited once or twice then lost track. Mullen Ave had many (rockin’) block parties and I remember Carlos playing playing one (more?) of the early parties. I remember Chepito driving a Rolls Royce down the block periodically once the Santana group started making real $$$. I lived at 1637 Florida st from1967 to 1972 which is just about a block away from Mullen. Everybody in the neighborhood knew Santana lived there. My friend Renee lived on Mullen just past where the road curved south, in the house with the spooky iron fencing. Her family knew this information too. Santana would play bongos in Precita Park with his friend/band mates and the sound could be heard all along the north side of Bernal Heights. information too. Santana would play bongos in Precita Park with his friend/band mates and the sound could be heard all along the north side of Bernal Heights. ( lived at 15 Massasoit 1972 to 1978). This is true about Bernal Heights , I watched a documentary clip in which drummer Michael Schrieve talked about Carlos and Gregg asking him to join the band , He said he went home told his parents , packed his things and took his place on the couch in Bernal Heights .